Alexandra contacted us in June 2015, when our original investigative efforts were in full swing. At the time, she was a sophomore in college, and 9 months pregnant. The night her mark appeared, she happened to be watching a sci-fi movie with alien abductions. The mysterious diamond shaped grid dots discovered on Alexandra’s left buttock. Our caseworker, Jordon, asked her if there was any reason in her surroundings for her to have overheated that night. Shockingly, her house was at a steady 68 degrees fahrenheit all evening, and she only wore a night shirt to bed. Waking up in a cold, damp sweat is not unheard of in the red grid mark phenomenon. In fact, a handful, myself included, were prompted to shower because of the thick moisture, wherein we find the mark on our bodies. Unlike other mark experiencers, those who sweat profusely prior to their mark’s arrival are more likely to report aching or pain, whereas the typical RGMP mark comes with no sensation or indication it is present on the skin. “My shoulder felt dislocated or I had been sleeping on it wrong and my hip has been killing me ever since this night. Also my throat when I woke up hurt like I had been yelling and my voice [is] raspy...” Certain her symptoms weren’t due to a circulating virus, injury, or overuse, Alexandra appealed to us for some other explanation. What could cause this combination of symptoms? To wake with unfamiliar pain and a grid mark on a private part of your body would upset anyone. Experiencers often express feelings of victimization. When you are sleeping, you are at your most vulnerable. For a seemingly unnatural mark to be placed while a person is immobilized and safely cushioned in bed leads many to blame an unknown sentient force. Experiencers can struggle with a sense of helplessness and violation. “I have nooo idea what this is and am so freaked out! Anyone I talk to thinks I'm crazy for even mentioning aliens but idk what else this could have came from! ?” Perhaps the show she was watching that night predisposed her to think she had a paranormal encounter while unconscious. She freely admits the possibility, but she also finds it too coincidental to ignore, especially when you have physical evidence on your body of something otherwise inexplicable. “I have just had lots of experiences with odd paranormal activity in every house that I've lived in and lately I've come to the conclusion that it's me.” Finding no other obvious explanation for the odd things she’s witnessed, she believes herself to be the only common denominator, that ‘spirits’ are drawn to her. Disclaimer: Our team does not ascribe to a paranormal or extraterrestrial source as the cause for the RGMP. If you wish to learn more about our theories, cases, data, and conclusions, please take a look at the materials available for download in our STORE. 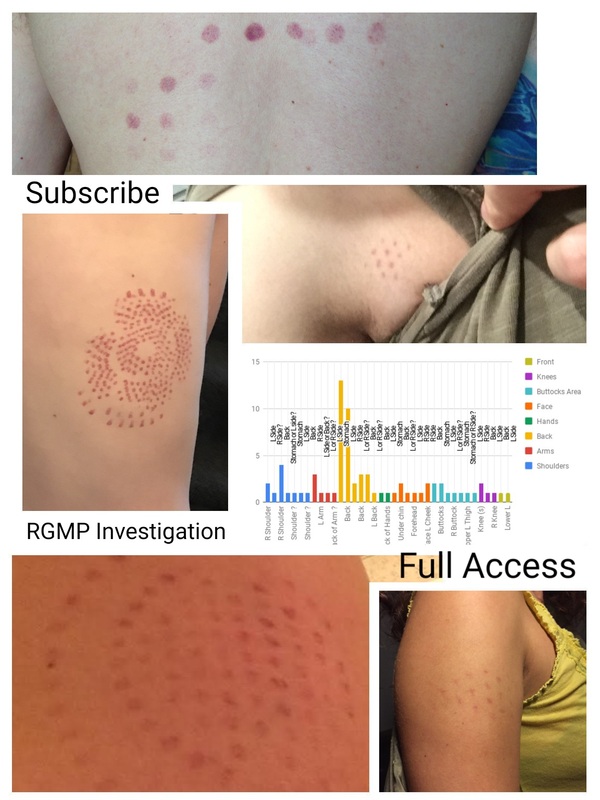 If you or someone you know has an unexplained grid mark on their body and wish(es) to report it, use the links to our survey and contact form provided in the left hand column. Email us your photos at experientialdreamingatgmaildotcom.